Stefania was born to a Catholic family in a village near Przemysl. They lived on a large farm and cultivated several different crops. While her father worked with the farmhands in the fields, Stefania's mother, a trained midwife, managed the house and cared for her eight children. 1933-39: Stefania's father died in 1938 after an illness. 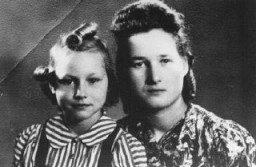 With her mother's approval, she joined her sister in Przemysl in 1939. At 14 she worked in a grocery store owned by the Diamants, a Jewish family. They treated her like family, and she moved in with them when the Germans invaded [Poland] on September 14, 1939. But two weeks later, the Soviets occupied the city [under the German-Soviet Pact]. The grocery store stayed open; Stefania shopped in the market for food to sell to their customers. 1940-44: The Germans again occupied the city in June 1941. Like all Jews in Przemysl, the Diamants were forced into a ghetto. Stefania's mother was sent to Germany for forced labor; Stefania was 16 and left to care for her 6-year-old sister. She found an apartment outside the ghetto and traded clothes for food. In 1942 news spread that the ghetto was being liquidated. Stefania decided to help some Jews escape the final roundups by hiding them. She moved into a cottage for more space. Soon, 13 Jews were living in a secret space in her attic. Przemysl was liberated on July 27, 1944. The Jews that 17-year-old Stefania helped to hide all survived the war. In 1961 she moved to the United States with Josef Diamant, whom she married.